Macrophages and Dendritic Cell Populations in the Respiratory Tract. The Role of T Lymphocytes in Mucosal Protection and Injury. The Regulation of Immunoglobulin-E Synthesis. Mast Cells and Basophils: Their Role in Initiating and Maintaining Inflammatory Responses. Eosinophils: Effector Leukocytes of Allergic Inflammatory Responses. Cytokine Regulation of Chronic Inflammation in Asthma. Neural Networks in the Lung. The Microvasculature as a Participant in Inflammation. Regulation of Airway Smooth Muscle. The Airway Epithelium: The Origin and Target of Inflammatory Airways Disease and Injury. Transition Between Inflammation and Fibrosis in the Lung. The Cell Biology of the Resolution of Inflammation. 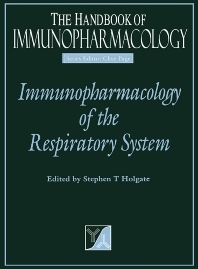 Stephen T. Holgate is a Clinical Professor of Immunopharmacology at Southampton General Hospital.